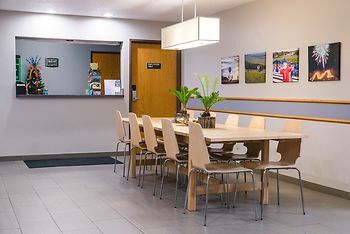 Hotel Mound View Inn, Platteville, United States of America - Lowest Rate Guaranteed! With a stay at Mound View Inn in Platteville, you'll be within a 5-minute drive of Mining Museum and Rollo Jamison Museum. This hotel is 3.2 mi (5.2 km) from University of Wisconsin-Platteville and 13 mi (21 km) from Dickeyville Grotto. It was a spacious, clean room, the bed was comfortable, nice location,nice decor. The breakfast nook was congested and in a bad location---right by the entry door. It would have been nice to have individual tables, not one big table where everyone sits.